UPDATE: Here's a link that I should have included to the Johnny Brenda's calendar page where you can purchase your all-day bus tickets. Tell 'em The Brew Lounge sent you; they like when you do that sort of thing. I'll put aside my snarkiness for a moment and recognize that Philly Beer Week, the organization, has coalesced and observed the market momentum from bars and their customers that have demanded a March-based Philly Beer Week. Screw St. Patty's Day and the thought that it was a viable excuse for moving PBW to June; I don't think many were "buying that". (oops, sorry, that sneaky snarkiness is back...get thyself back). 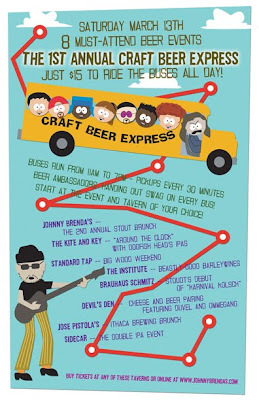 So, here's what 8 enterprising establishments in Center City Philly have put together for us all on March 13th. The idea is pretty simple. Pick a bar to start at; it doesn't matter where. I'm thinking if I jump in on this idea, I may find myself at Brauhaus Schmitz, for example. I need a good reason to (finally) visit for the first time. Buses will be running continuously for 8 hours from 11am-7pm, picking up those that have paid their $15 for unlimited rides on the bus, and dropping riders off at any of the 8 bars along the way. No rules how long you must stay at each location or how many you must visit. But, with the bus option, getting around has never been easier. ~ "Around the Clock" with Dogfish Head at the Kite and Key where you can get 60, 90, and 120 minute IPA on draft along with other DFH surprises.